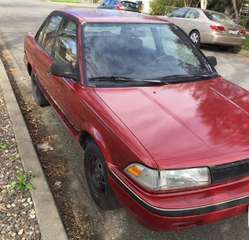 1992 TOYOTA Corolla, 149k miles, exc cond, $1600. Serious inquiries, 956-445-2188. TriCities. THREE TRANSMISSIONS: 1957 Chevy, 1984 Chevy, one unknown year, bellhousing, starters & alternators for Chevy's, asking $200; 541-371-1829, Lexington. DUNE BUGGY, 1600cc ? motor, needs work, doesn't run, have title, $1200 obo. 509-539-1094. TriCities. 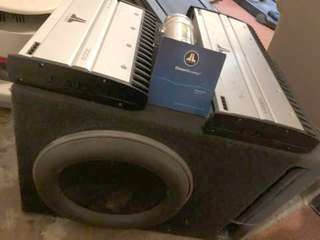 JL AUDIO car stereo system, 2 amps, 1 capacitor, W7 13.5" subwoofer, have receipts, new $6000, great deal at $3500 obo. 509-619-5163. Kennewick. USED TIRES: 4 wheels and tires, 6 hole, Ford, 275/70RN, 4 tires, Toyo, 265/20/R17, 4 wheels and tires, 235/75R15, 5 hole car; 541-701-8776, Hermiston. PLEASE BE advised that the Giant Nickel is NOT affiliated with any other publication in our area, including ones that use "Nickel" in their name. If you have any questions please call us directly at 783-5455 or 452-5551. 2014 Grand Touring, white pearl/ black interior. Retired 1 owner, non smoker, always garaged. All maintenance records, exc cond plus! This car is an absolute blast to drive. EPA mpg is 28 city/ 38 highway. Clean title, no accidents, 28k mi. For more fun, turn on sport mode for faster acceleration/ steering. 6-7/32 inch tread on Dunlop all season tires, 2.5L DOHC eng, 184 hp, 185 ft.lb torque. Most Mazda 3s for sale only have 2L engines. 18" Enkei alloy wheels, moon roof, heated leather seats, 6 spd auto/ manual trans, with paddle shifters, nav, tech package, 6 way power seat, blind spot monitoring, rear view camera, rear cross traffic warning, smart city braking, forward obstruction warning, Bose 9 speaker premium audio system, Pandora, AHA, Stitcher HD radio & USB inputs, XM radio, B-Xenon adaptive headlights ($2500), other extras, see photos giantnickel.com, paint protective film on all 4 sides, roof, hood. High Kelly Bluebook $18,985. Asking $17,950. 509-972-2550. 2002 PT CRUISER: many top of the line features, $1,200 negotiable; call for details, 541-938-3497, Milton-Freewater, OR. 2002 PT Cruiser, many top of the line features, $1200, negotiable. Call for details, 541-938-3497. MltnFrwtr. Body & mechanical parts. Parting out '64- '77 Chevelles, El Caminos, & Novas; '67-'79 Camaros & Firebirds; Also GTOs & Monte Carlos. Dan's Garage, 508 Bruneau, Kennewick. 586-2579 days. CADILLAC DEVILLE: Rare Edition Biarritz 2002 model, 104k miles, second owner, good condition, $5000 541-571-0820, Hermiston. CARBURETOR Service: I have over 20 years of experience rebuilding, modifying, & tuning carburetors & distributors, both foreign & domestic. I specialize in classic cars & trucks, & have experience with carbureted boats, bikes, RVs, & industrial equipment. Performance engine rebuilds & motor swaps are available. I can come to you with mobile service if needed, & I offer a 30 day warranty. Call Andy at Performance Carburetor Service, 509-579-5959. TriCities. SALE: 2011 Nissan Cube, 1.8S, $6500. Exc cond, clean, comes with locking trunk compartment, snow tires, keyless entry, cd, am/fm radio, adjustable back seat, lots of head room. Pattb@aol.com, 509-412-2777. Pasco. 1999 Chevy Lumina, pwr windows, locks, tilt, cruise, 101k mi, $2990. Dlr, 509-948-0336.